The MySQL SELECT statement is used to retrieve data from one or more tables present in the database. 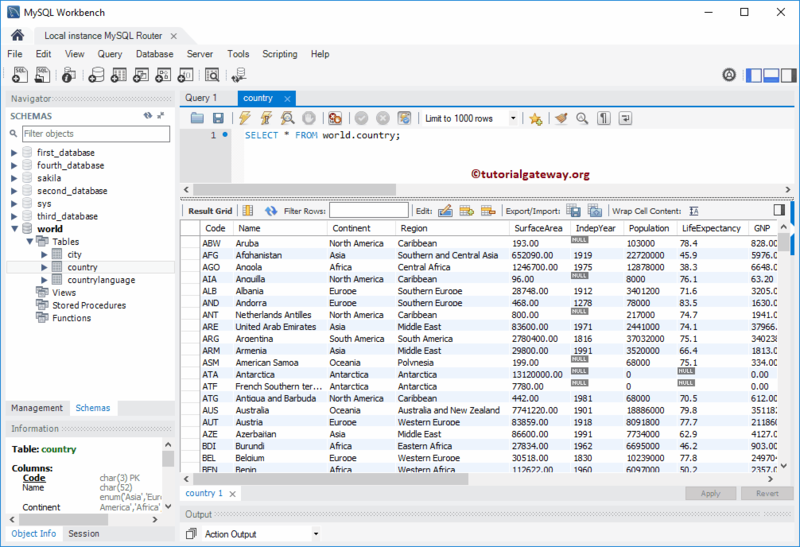 In this article we will show you, How to write SELECT statement in MySQL with example. In order to explain the MySQL SELECT, we are going to use the world database that came along with MySQL installation. Column Names: Depending upon the requirement, you can choose the number of columns from the tables. It may be One or more. 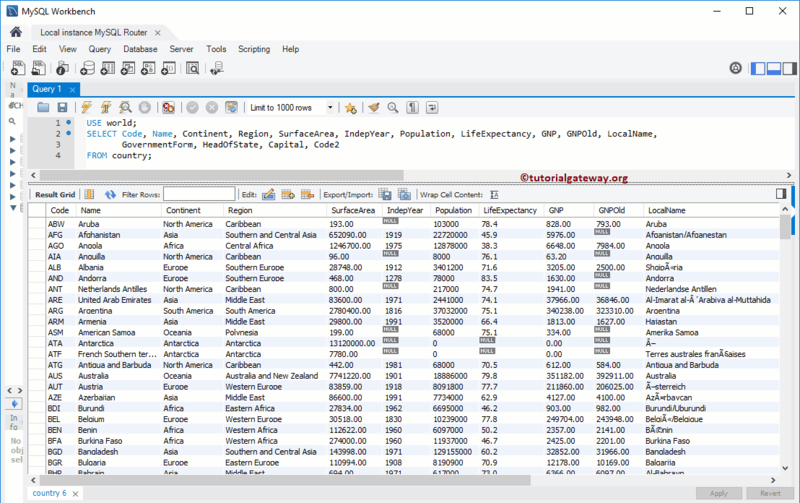 Source: One or more tables present in the Database. MySQL Joins are used to join multiple table. You can use the SELECT statement in MySQL to retrieve rows without referencing. For example, below statement will return 2 as output. In the above case, MySQL allows you to use DUAL as the dummy table name. Again it is just an option. In this example, we are going to select all the existing Columns present in the country table using asterisk (*). 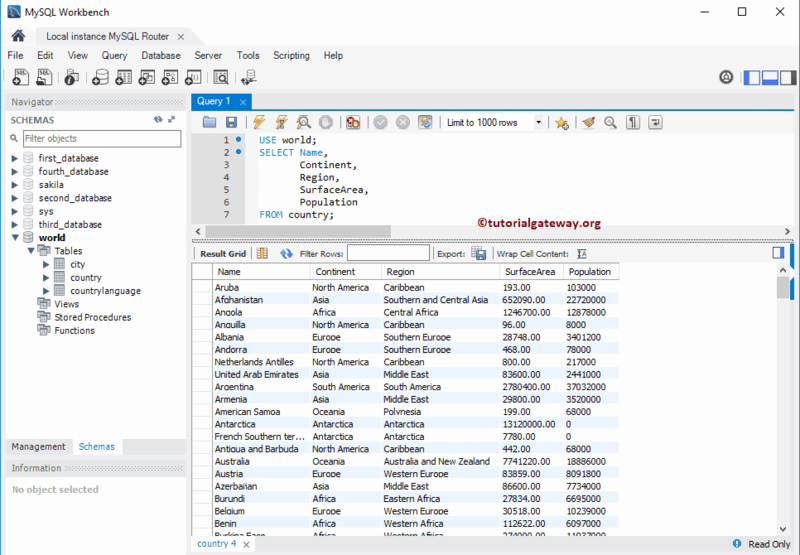 In MySQL SELECT statement, * is the shortcut to represent all the columns that are available in the source tables. Remember USE world will change the default database to world. Or, You can also try using schema name before the table name. It retrieve all the columns from the specified Table. Most of the times we don’t require all the column in a table. It retrieve the columns in default order. Some times we may need to alter the columns order while displaying them. If there is any changes made in the underlying table (Reordering Columns, Adding, or Removing Columns) will not reflect the Views created using SELECT *. NOTE: Please don’t use MySQL SELECT * FROM statement in real-time even if you want to retrieve all the columns present in a table. In real-time, selecting all the existing columns in a table is not the case. Because there will be some columns such as IDs, Bar codes, Modified dates, Rowguid, Photos etc, which might not be required in the select. For this, MySQL SELECT statement allows us to select few or any specific column from table or tables. This can done by placing the required Column Names followed by SELECT keyword. 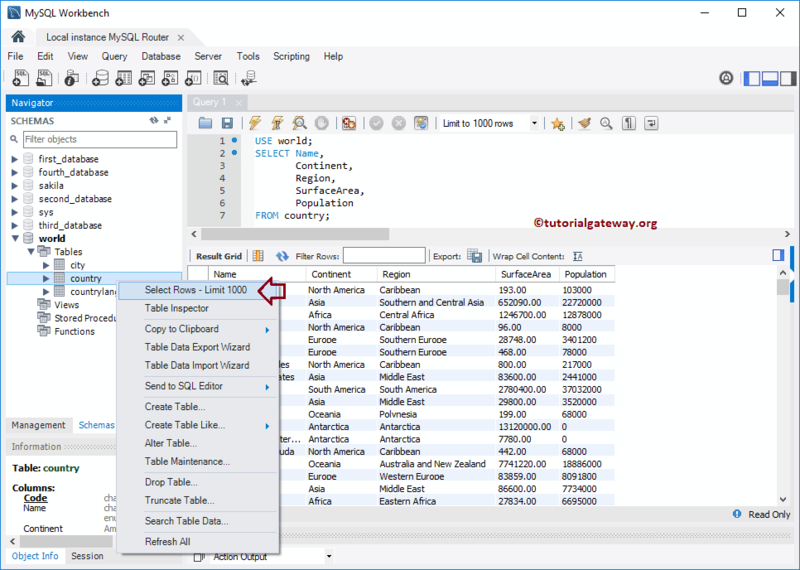 If you don’t know the query syntax, or you don’t want to write a SELECT query then use MySQL workbench Intellisense to write the SELECT Statement for you. This option will generate the SELECT Statement for us. NOTE: If you want to see, all the records then change the Limit to 1000 rows in query window to Don’t Limit option. 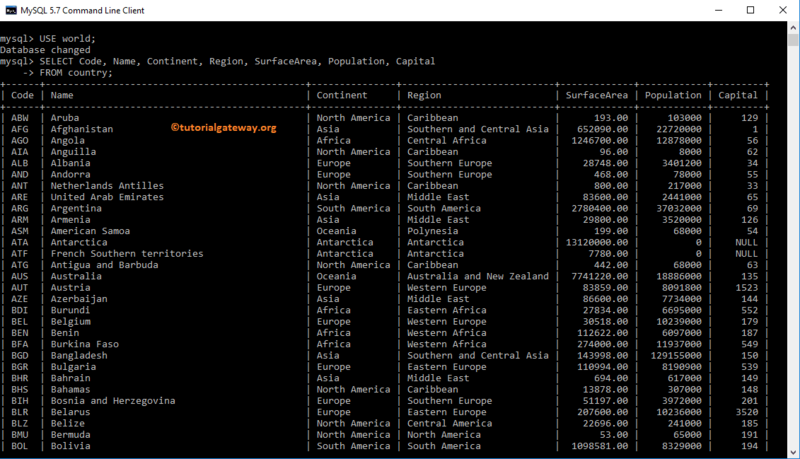 In this example, we are going to write select statement in MySQL command prompt to select few columns from country table. The MySQL SELECT Statement return all the records present in the table. If you want to restrict the Rows then please use WHERE Clause.